The Park Geun-hye administration is steadily releasing more details about its policy on national reunification. As reported in the Korea Joongang Daily, the topic of reunification finance has attracted attention both at home and abroad since President Park's major address recently in Dresden. 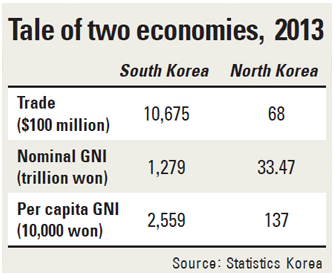 The Korea Joongang Daily reported on a speech by Shin Je-yoon, chairman of the Financial Services Commission in which he indicated that the Korean government will help attract foreign capital into North Korea if the regime opens up its economy. “For now, we don’t encourage investment, because they don’t have basic legal structures yet. If they open the market to global markets, then we will help them induce foreign investment for development. “If those kind of basic areas like legal services or consulting services by commercial entities like investment banks are prepared, we will encourage foreign investors to make investments. We are always ready to help,” he added. Also in his speech at the 2014 Korea Economic Forum hosted by the newspaper,FSC Chairman Shin proposed four key tasks in preparing for unification in the financial sector: resetting the monetary system, adjusting the exchange rate system, reforming the financial infrastructure and financing development needs.